If you’ve been growing sunflowers with us as part of the Compton Hospice Sunflower Challenge you need to measure your sunflowers today. There are fabulous prizes on offer for the tallest bloom, so measure up and contact Compton with your vital statistics. Our tallest is currently 1m 65cm. They got up to 2m 47cm last year, so there’s plenty more growing to be done. How tall are yours? 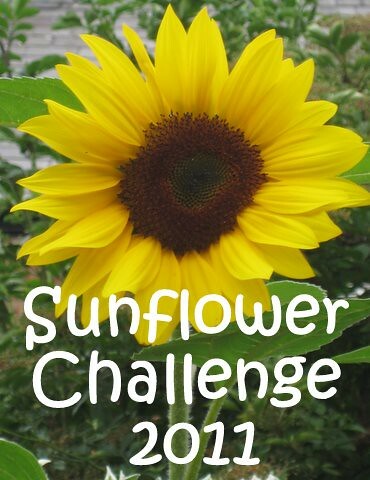 If you’ve been enjoying growing sunflowers (whether you’re joining in the official challenge or not) and have a sunflower-themed play idea to share with us – we would love to see them. Please add a link to the Linky at the end of this post. We’ve shared some ideas for art, science and math in our Sunflower Activities ebook, and here’s one more idea for sunflower fun. Sunflowers love sunshine of course and grow best when they’re in full sun (challenge contenders take note! ), so why not combine the two with a dash of horology science to make a sunflower sundial. 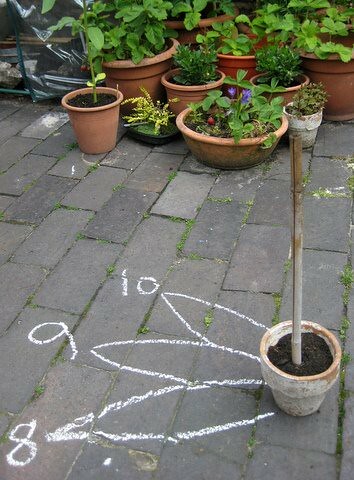 Materials: a stick, a flowerpot filled with soil (or something else to hold the stick upright), a clock timer, yellow chalk, a patio / driveway /yard and sunshine! Place your stick in the flowerpot, so it stands upright and then place the pot in a part of the patio or yard which gets the sun all day. At 8 o’clock use your chalk to draw a petal on the ground, with the tip of the petal marking where the shadow of the gnomon falls. Add a number 8 to the tip of the petal. Set your clock timer for 9 o’clock. When the alarm goes off, it’s time to mark out the location of the 9 o’clock petal. Continue setting the timer and marking off your petals throughout the day. You could try out some the the ideas in our Sunflower Activities ebook or from the linky below to help you pass the time. We had lots of excited shrieks when the alarm rang! Talk with the children about what’s happening with your sun clock. Why do the shadows move? Why are the shadows longer sometimes and shorter at other times? Do they think the pattern is different each day or the same? Share an idea with us for any kind of sunflower-themed play idea, craft, activity or experiment. The linky will be open until the end of the month, so plenty of time for you to join in if you would like. Help us gather a great resource of sunflower ideas. That’s a great idea Zoe. My girls wonder about the sunflowers ‘being alive’, as they turn their faces round to look in different directions. Aaaah what a lovely Sunflower craft idea! I bet the girls LOVE it!!! Are the petals all bunched up for some “hours”? Would love to see the final “dial”. When my two are older (and can read the time just a little or maybe lots) we will have a go! I love the idea of a sunflower sundial! Thanks for linking up to Science Sunday.